When I smoked, the cost was one of the biggest downsides. 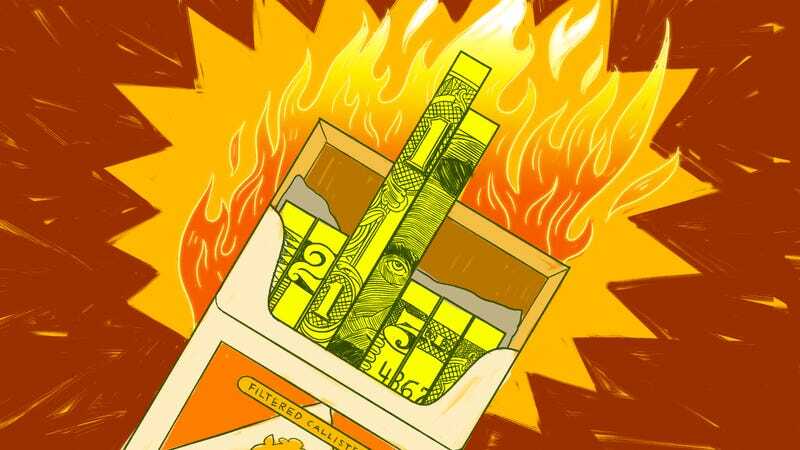 As someone who constantly worries about money, no matter my financial state or employment status, buying packs of cigarettes, then literally watching my money turn to ash, felt even more painful than the less immediate threat of cancer or death. That meant that I would often forego fun activities and purchases so I could feed my addiction. As Floridians, that’s likely true for you, too. Your state offers a huge variety of beaches, outdoor activities, amusement parks, and more. There are so many better ways to spend your time and money. But just how many? Based on the premise from The Balance that the average pack costs $6.28, and assuming you smoke a pack a day, we did the math to find out what more you could be spending your money on. Foregoing that pack for an entire year means you’ll save $2292.20. Things that might seem out of budget now are way more affordable if you quit. Imagine floating through the bright blue waters off of Key West, sipping on a cold drink, and working on your tan. Eventually, you could snap up tuna, mahi mahi, or even a marlin or two. It sounds luxurious because it is. I did a little research and chartering a private fishing boat in the Florida Keys can set you back between $700 and $1400 depending on the company you use and the number of hours you book. But if you end up foregoing your daily pack, you’ll likely have enough money for two full day trips a year. Every year, tourists flock to the state’s amusement parks, riding coasters, and eating gigantic legs of turkey. You lucky Floridians are close enough to access these famous parks (and their smoked meats) whenever you want. But going more than once a year might seem prohibitively expensive. Not the case if you quit smoking, though. A Gold Pass to Disney World, for example, costs Florida residents $549. With all the money you’ve saved by quitting smoking, you could get four passes, one for yourself and one for everyone in your family. One of the best parts about living in Florida is the (mostly) year-round good weather. That means you can enjoy the great outdoors (or your great backyard) whenever you want. So get yourself a grill! And with your newfound savings, get yourself a nice grill. Ditch that $99 run-of-the-mill charcoal contraption that’s been gathering dust on your deck. Instead, spring for one that cooks your meat to perfection, like the Big Green Egg. Prices vary, but you can expect to pay around $849 for a large one, according to the Spruce. It’s perfect for a healthy Florida-sized yard, and with all the money you saved foregoing your daily pack, you’ll have extra cash for some high-quality grill accessories. While a fast-paced jet ski ride in the summer is fun and adrenaline-inducing, the rides are not cheap. Especially when you’ve got to shell out a few hundred bucks for rides for your whole family. That’s not the case in your new post-cigarette world though. Some cursory research shows that jet ski rentals can cost around $150 for an hour. That means you can pay for about 15 rides a year. For a family of three, that’s about 5 jet ski excursions a year. Worth it? I’d say so. Want to hear the best news? You could enjoy some or all of the above at least once a year if you give up smoking, on top of the many other benefits. This post is a sponsored collaboration between Tobacco Free Florida and Studio@Gizmodo.